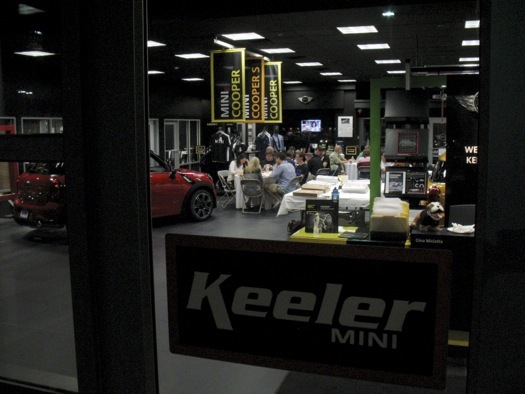 This is it, the second leg of the semifinal of the 2014 Tournament of Pizza, sponsored by Keeler Mini. The results of this leg will decide which two shops face off in the tournament final. This year's all-champions format has resulted in four past overall tournament winners meeting in the semifinal: 5th and 50 of Scotia (tournament champ in 2011), Marino's of Schenectady (2010), DeFazio's of Troy (2013), and Marisa's Place of Guilderland (2012). 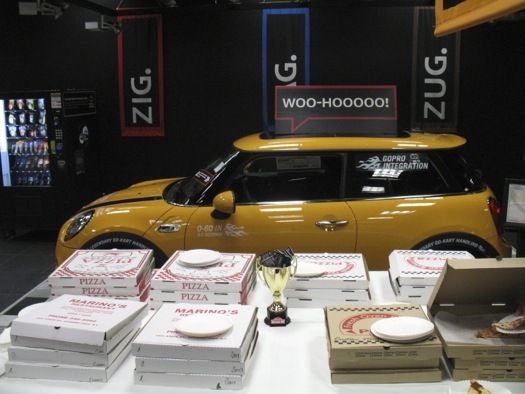 The TOP semifinal is a contest with two legs, each pizzeria offering up a pizza for each leg of the contest (so two pizzas from each shop, eight pizzas total). The two best aggregate scores advance to the final. The theme for the first half of the semifinal was "classic." The theme for the second: "spicy." Unlike in years past, the judging this year's TOP is not blind. Pizzas are scored in four categories: crust, sauce, toppings, overall taste. The scores from the judges -- each matchup is scored by a panel of 4 or 5 judges -- are combined and pizzas are scored on a 0-100 scale. And now onto the "spicy" pizzas. The overall theme of the judges' remarks on 5th and 50's spicy chicken parm was that the pie was heavy. There was consensus that the crust was similar to 5th's pizza in the first leg -- "bready" and bit too tough for the judges' liking. A few judges liked the heat level in the sauce, but others found it "heavy handed." Judges noted the breading on the chicken was coming loose, creating "mushy" texture. And the judges thought the ricotta failed to register. This pie was the low score on all of the judges' sheets. But as one concluded, "If I were stoned, I'd eat this all day long." 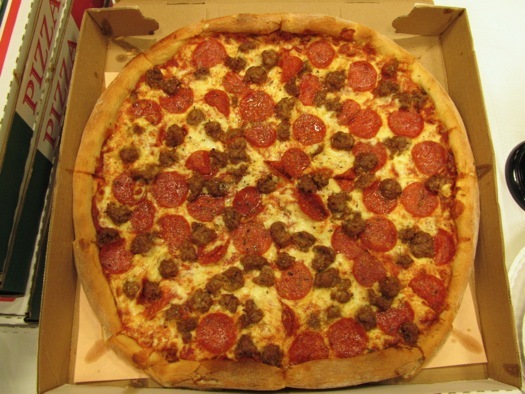 A few judges thought the crust on Marino's hot sausage and pepperoni pizza was a bit thicker than that of its other semifinal offering, and they noted a bit toughness (perhaps because of travel). The sauce was described as "hearty" and one judge commented that its "sweetness offset the spicy meat." Where Marino's really scored well was on the toppings. Judges said the pepperoni had "bite." And the sausage had good browning, and was "deliciously spicy and fennel-y." Concluded one judge: "Great, well balanced slice with big, bold flavors." 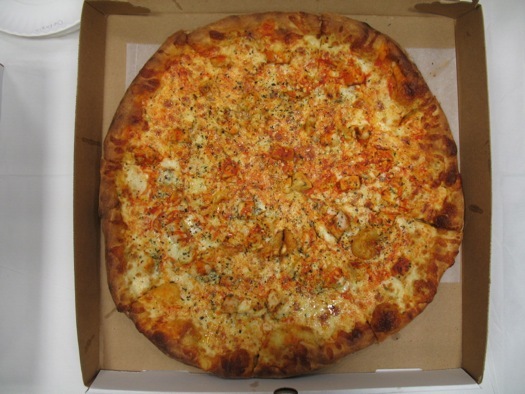 Defazio's Buffalo chicken pizza has a distinguished TOP history -- it scored an all-time tournament record high 86 in last year's final. And this year? It did... OK. Judges enjoyed the "poofy delight" of the crust. 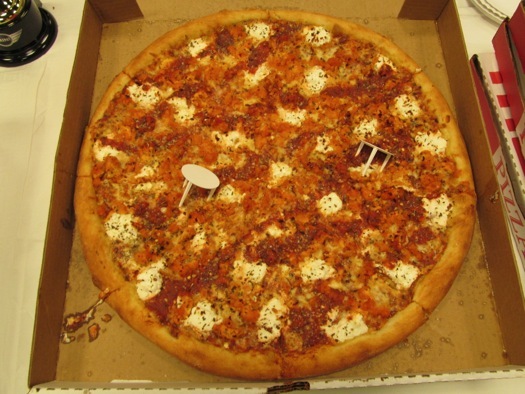 A few thought the hot sauce on this year's pizza was overpowering -- said one judge, "WOW, THAT'S HOT." The judges complimented the chicken -- "insanely tender" -- but a few wanted to see more of it. And the blue cheese was described as "great." But something just didn't click for the judges. (A few thought this year's pizza seemed a bit "dry.") As one judge summed it up: "It's a tasty slice, but it's not the champion winning pie of the past." Would it be enough to hold on for a spot in the final? 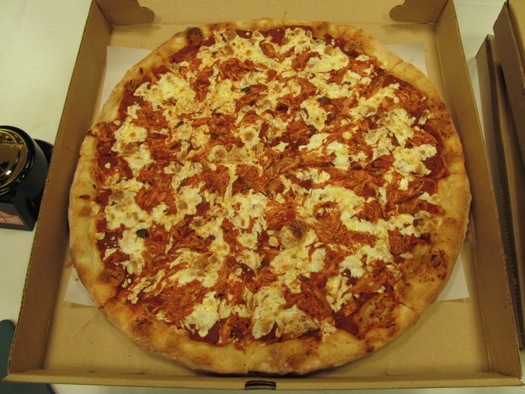 Judges thought the crust on Marisa's chicken cacciatore pizza traveled well -- they praised it for having "great flavor" and good "crispness" on the end crust. The sauce was described as having "a slow, smoldering burn." The addition of olives to the pizza delighted the judges -- "feels special," said one judge. But the shredded chicken got mixed reviews. Judges noted it had good flavor, but was dry. And the fresh mozzarella didn't travel well and some thought it got lost in the other elements. Said one judge of the pizza, "I liked where this was headed." And another: "Interesting spicy heat, but flavors don't really meld." Marisa's Place came thisclose to that last spot in the final, but it just couldn't get past DeFazio's. Congrats to Marisa's Place and 5th and 50 for representing themselves with quality and some interesting choices this year in the Tournament of Pizza. This was probably the toughest-ever tournament and they almost made it to the final. Marino's and DeFazio's will meet in the Tournament of Pizza final this Saturday at Shmaltz Brewing in Clifton Park before a packed crowd. The judges will pick the winner of this year's tournament based on two pizzas from each shop, and the crowd will choose the first-ever People's Choice Plate winner for the best single pizza. If you didn't claim a ticket, you have one more chance to do so -- TOP final event sponsor The Capital Team will be giving away tickets on its Facebook page. We really looking forward to the this final -- it should be quite a showdown. defazio's has been my go to pizza place in the capital region for the last 5 years. goat cheese pizza with a whole wheat crust is 5 stars at that pace every time. only tip with their pies is make sure to eat them hot. if you get it delivered or carry out, then hit it in the toaster oven or microwave for a minute to make sure it's piping hot. it loses something when it cools off even a little.